Ares is the god of War (Mars being his Roman equivalent) and is one of the offspring of Zeus and Hera and one of the Twelve Olympians (the chief gods) so he’s a pretty big deal figure in Greek Mythology. As the god of war, Ares had a dual role to play in that he inspired courage on the field of battle but, on the other hand, he was also the one whipping up the conflict in the first place. Indeed, his sons Phobos and Deimos represent terror and fear, just to underline the fact that those are the responses Ares elicited with his war-mongering ways. Ares’ throne was upholstered with human skin and Spartan kids sacrificed puppies to him. Nice. Despite being a god of War, Ares was not averse to getting embroiled in matters of love – or at least lust. Through dalliances with a long list of women, he produced scores of offspring. His most famous affair, of course, was with Aphrodite. Helios, the sun god, spied Ares and Aphrodite canoodling and reported this to Hephaestus, the goddess of love’s husband. He then constructed a net so fine it was almost invisible and ensnared the lovers in it, humiliating them by inviting all his Olympian friends to come and gawk at them. Mortified Ares then scuttled off to Thrace to lick his wounds. I struggled quite a bit with drawing Ares. I aspired to convey his callousness, to capture his cruelty, but I am not sure I did so convincingly. 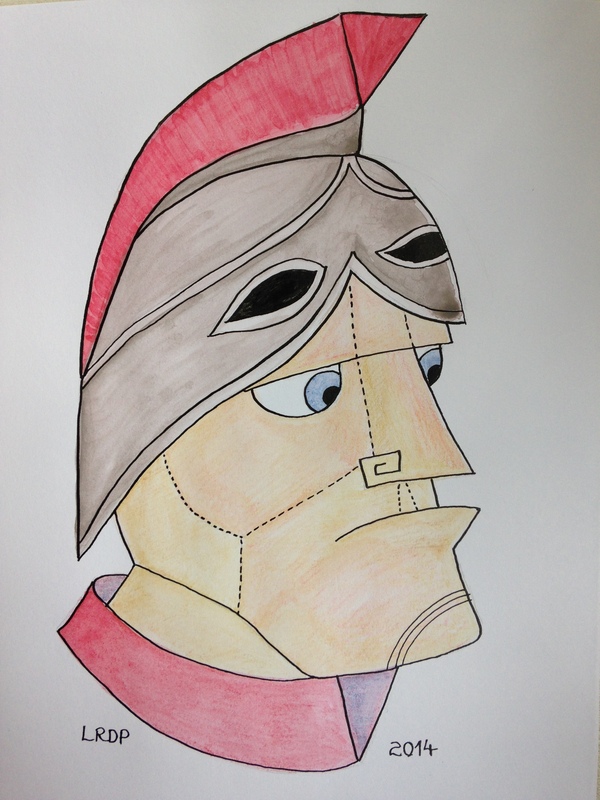 Not knowing much about Ancient Greek armour, I borrowed the shape of his helmet from the famous statue of Ares that stood in Hadrian’s Villa. I fussed and fidgeted with the sketch and erased a lot until I arrived at something I was satisfied enough with, if not entirely happy. I decided to make Ares look militaristic by giving him the look of some kind of brutish drill sergeant. 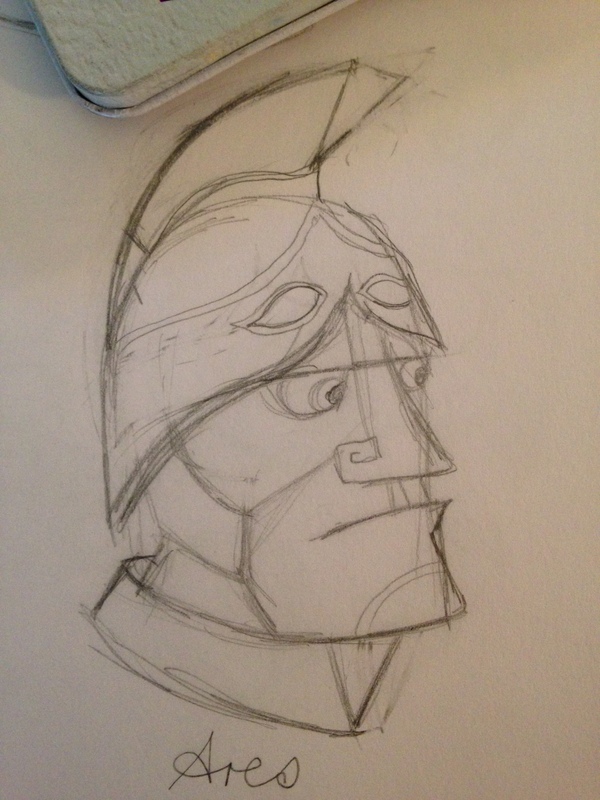 I also wanted to make his face quite angular, with sharp lines to imply harshness. I gave him a pugilistic jutting chin and a downturned mouth, all taciturn and coiled violence. I opted for red for his helmet’s plume and his collar since red has connotations of anger and aggression. I am not entirely happy with this drawing but time was very much of the essence today so this effort will have to do. I really must find inspiration to do something like you’re doing – 30 pages in 30 days or something along those lines. Thanks for making me think about it!